Our window cleaning crews are made up of hard working, loyal, professional, safety minded, talented, enthusiastic, quality workers. They are all outgoing customer service experts that can anticipate what the customer requires to be completely satisfied. All of our uniformed crews leave in trucks from our facility, in Vernon, with all the tools needed to get the jobs done. They travel all over the tri-state area cleaning windows inside & out of customers’ homes. Our crews only work about 40 hours a week, earning $450-$600, and they have very flexible schedules. Working for All County Window Cleaning also means much more than just a paycheck. Of course that’s the reason why you get a job in the first place but wouldn’t it be nice to know when you go to work you are receiving more than money. As a window cleaner you actually brighten people’s days. You are performing a service that people really do not like to do on their own and because of your training and learned ability the customers are greeting you into their homes with a smile and letting you leave with their thanks and appreciation. By the end of each day you will have had at least a handful of compliments praising you as a person and your work as well. This job also lets you experience living in the tri state area. Meeting and conversing with all walks of life keeps the day full of learning experiences. You’ll develop friendship bonds with your coworkers that can continue to grow even if you move onto a new career path. You’ll work for a management team that encourages and supports its staff to better themselves however they feel they need to. We’ve seen our employees attain their college degrees, join the military, join the police force, become firefighters, become successful salesmen, travel the world, settle down to make a family, and even go into business for themselves. All County Window Cleaning has stood by them all by writing letters of referral, loaning money, giving paid vacation time, and giving paid personal time. We’ve had employees leave to continue their college education and have welcomed them back whenever they had the time available to give us. We have had our employees move on to different jobs and have always left the door open for them to come back if they ever wanted to. We at all County Window Cleaning understand that our employees need to be happy with their lives in order for them to perform with excellence here. Because of that we offer our help to our employees in any way we can. If you think you’ll fit in with our business as described, then please see what else we require. Fearless of heights. 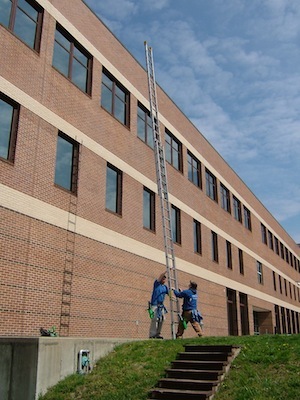 Ladder work is a necessity and no other job in the world uses ladders on a daily basis like window cleaners do. Please download and complete the 2 forms below and bring them into the above address.